Kicking off the first in our series of recipes that perfectly pair our beers with food, this one is a meat-lovers dream. 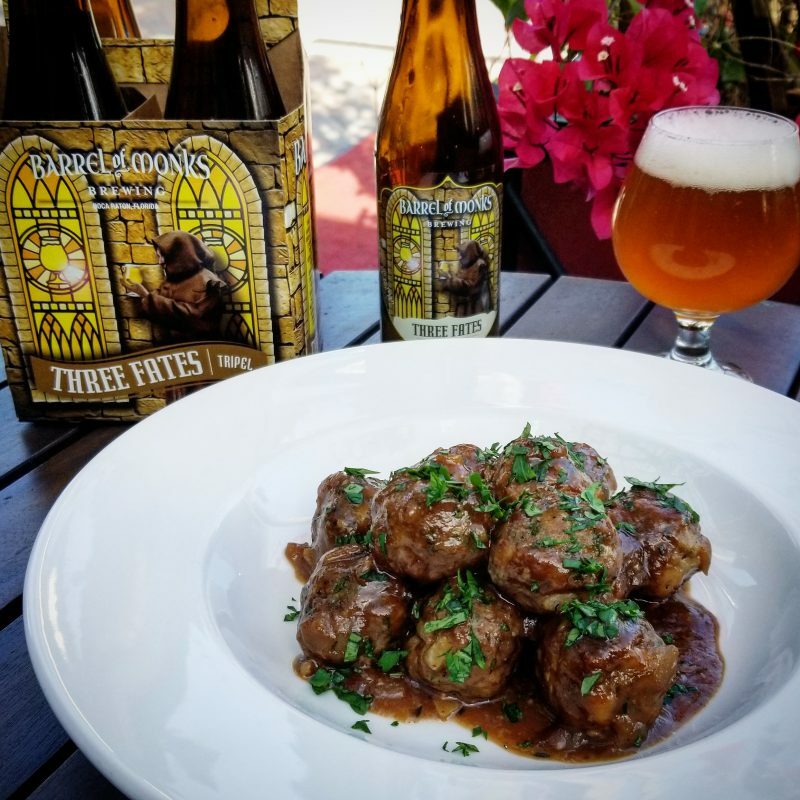 Belgian style meatballs with a wonderful sauce containing a couple cups of our Three Fates Tripel. Pick up a 4-pack of the beer, drink a few, and cook up a batch tonight. Mix breadcrumbs and beer in a small bowl until moistened and combined well. Place ground beef and pork in a large bowl and mix with hands until just combined. Add in onion, garlic, parsley, eggs, breadcrumb mixture, salt, and pepper. Mix by hand until combined well. Form 1.5 ounce meatballs with a small scoop or roll by hand. Should yield about 35-40 meatballs. Place on a sheet tray and bake in oven for 12 minutes. Turn tray and bake an additional 6 minutes. Saute onions in medium pot over medium low heat, stirring occasionally, until caramelized and sweet. About 20 minutes. Add thyme and cook 1 minute. Add brown sugar and vinegar, stir well. Add flour to make a roux and stir constantly for 2 minutes. Add beef stock and beer slowly while stirring with a whisk. Bring to a boil then drop to a simmer for about 30 minutes or until thickened. Add cooled meatballs to pot and stir gently until well coated and heated through. About 5 minutes. Serve with french fries and a cold B.O.M. Three Fates Tripel in a snifter.